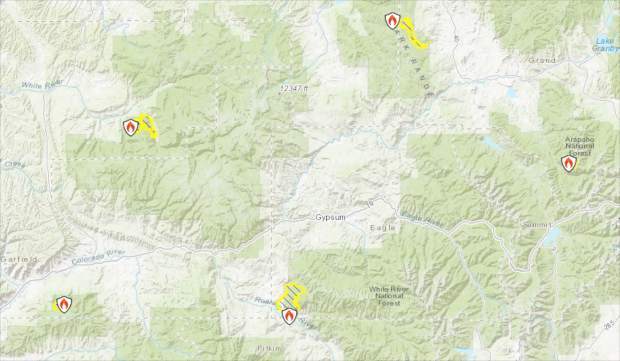 Source: InciWeb The wildfires burning around the perimeter of Eagle County are, clockwise from bottom left, Cache Creek, Cabin Lake, Silver Creek, Sugarloaf and Lake Christine. Get the most up-to-date information on each of these fires at https://inciweb.nwcg.gov. RIFLE — Cooler temperatures and precipitation on Monday night, Aug. 20, and Tuesday, Aug. 21, helped federal firefighters gain an upper hand on the Cache Creek fire burning southwest of Rifle and east of Battlement Mesa. As of Tuesday midday, the fire that began as a result of a lightning strike on Saturday, July 28, had burned 2,708 acres and was 40 percent contained. Earlier containment on the fire had reached more than 60 percent before winds blew the fire over established containment lines last week. Some backcountry structures along Battlement Reservoir Road have remained on pre-evacuation status, but no structures have been lost to the fire. “Firefighters are taking advantage of the precipitation that materialized out of storms passing through the region today,” according to a Tuesday update issued by the incident command team. The weather forecast called for an increase in the chance for rain Tuesday night and into Wednesday, which was expected to continue to help with the firefighting effort. However, conditions are expected to dry out again Thursday, with some afternoon storms possible over the higher terrain through the end of the week, according to the latest National Weather Service forecast. Tuesday’s smoke outlook from the Colorado Department of Public Health & Environment listed air quality as “good” for the Colorado River Valley, with health advisories for much of the Front Range. Smoke continues to blow into the Eagle River Valley from wildfires across the west. In addition to the Cache Creek fire, the Lake Christine fire near Basalt continues to burn on 12,588 acres with 90 percent containment, according to the latest incident report issued Wednesday, Aug. 15. The Cabin Lake fire near Meeker has grown to 6,072 acres and has reached 58 percent containment, with total personnel numbering 469. The 4,745-acre Silver Creek fire still threatens homes near Kremmling, but at 1 p.m. Monday, Aug. 20, the Grand County sheriff lifted evacuation orders for both Old Park and Gore Lakes areas and residents were able to return to the area. The areas remain under pre-evacuation status, with the fire only 13 percent contained. Near Fraser, the Sugarloaf fire sits at 35 percent containment and has thus far burned 1,280 acres. The area is rugged and steep, remote with no roads and no safety zones for firefighters. Firefighting resources continue to camp out near the fire, monitoring, patrolling and testing pumps and hoses for structure protection purposes daily.